Day 3 of ice levels! WHOOOOH! I love third days AND ice levels! So I guess I’m in luck, and so are you! Anyway, as maybe one or two of you know, earlier this year our buddies at Fangamer helped launch the crowdfunding campaign for Koji Igarashi’s new game Bloodstained: Ritual of the Night. And since I love me some Castlevania and learned* some tricks from everyone’s favorite foodscooter Romscout, I helped the cause by streaming Symphony of the Night all in one sitting. 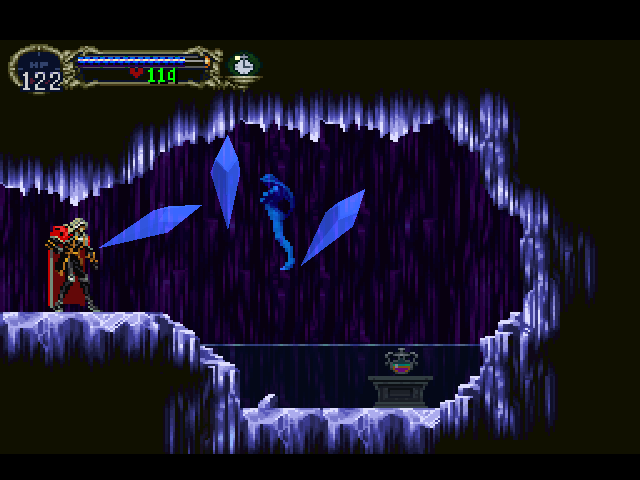 That’s why today’s ice level is The Underground Caverns, straight out of SotN! Symphony of the Night, my friends. SotN. I’ve played this game a few times, but by far my biggest interaction with it has been watching speedrunners blast through it. So instead of giving you the so-called “official” plot, let’s tell that story instead. This is the tale of Alucard, a half-vampire who discovered that scooting backwards is much faster than walking. 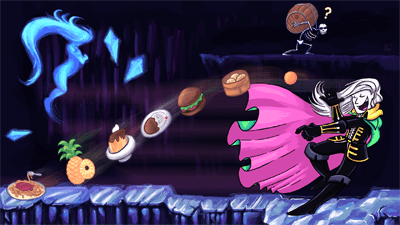 One day, he found out that scooting with the Item Duplicator and the Meal Ticket caused him to shoot a trail of food behind him, and thus the foodscootin’ half-vampire shot through his dad’s castle in a quest to murder him. Oh, his dad’s Dracula, too. I probably should have opened with that. Anyway, in the middle of his scootracing, Alucard picked up a garnet. “I love this thing!” he cried, “but what do I dooooo with it?” Fortunately a fairy familiar popped up to say something, only to be interrupted when Alucard bolted into the nearest shop. This naturally gave him roughly a gazillion garnets, which he then sold to buy a green and pink cape. Then he scooted up the castle and turned into a bat and flew into everything in his path, except for Richter Belmont, which he flew over so he could skip the cutscene and most of the castle after it. Once he got to his dad’s room, his dad turned into a giant weird thing with lots of faces and fell down when it turned out Alucard also bought a gazillion Buffalo Stars and shot every single one into the guy’s face. Faces. Whatever. Then I Am The Wind plays and everyone bursts into song because clearly that is the ballad for every generation. THE END. The Underground Caverns itself is big enough and has its own boss, though the ice rooms are relatively small. Early on, a Scylla Worm attacks you in a tiny room, and this is just a taste of things to come. Move just a few screens down, and Scylla herself will attack, so be prepared. The icy areas are full of Frozen Shades, which are icy spirits that fire giant magical icicles at you. It even has some frozen pools that you can break the ice on! Neat! This area isn’t too tough honestly, but just watch out for the frogs. Frogs are a menace. Because it’s SotN. Not pictured: Romscout% Full wallpaper’s HERE! And now for music! Crystal Teardrops plays in the Underground Caverns, and hey, if it has a couple of icy rooms then I say it counts! For more Konami-songy-goodness, here are some winter-themed Bemani tunes! Like the Flowers that Whirl in the Moon Snow and Midnight Sun Lantern are both from Pop n Music, snow storm is from Beatmania IIDX, and Frozen Ray is from Keyboardmania. It’s Castlevania, so you know there are some Crystal Teardrops remixes. Throb and Pulse Crystal is by Snakethoot, and this unnamed piano mix is by Verdegrand. But hey, let’s throw in a few other completely unrelated remixes, shall we? This cover of Frosty Village from Diddy Kong Racing was made by insaneintherain, who’s a pretty awesome sax and piano player if I do say so myself! And this medley by FamilyJules7x covers several of the icy tracks from Diddy Kong Racing too! You might recognize it from this retrospective featuring classic clips from past TSG holiday marathons. Speaking of which, don’t forget about the Pokémon Retrothon, December 17-20! We’ll be raising money for the Rockin’ H Ranch, so tune in and help out some great causes. And be sure to come back tomorrow to see the next ice level! * in that I don’t actually know how to do any of the tricks despite seeing these goofs run this game hundreds of times. But I know they exist! BECAUSE SOTNObligatory Ice Level DayOILDSOMEONE HELPTOO STRONGUH DISAGREE?? ?